The brilliant scientist, Dr. Bruce Banner, was caught in the blast of a test Gamma Bomb, exposing him to seemingly deadly gamma radiation. He began experiencing strange symptoms during times of stress – his mind and body would change and grow into a hulking beast of a man, full of rage and superhuman strength. “The Hulk” is a comic book superhero character from Marvel Comics. He first appeared in the 1962 comic, The Incredible Hulk. This character has stood the test of time and has remained incredibly popular, with comics continuing to feature him to this day, and big budget blockbusters, such as The Avengers, featuring him as well. Though his origins pointed to his destructive nature, The Hulk’s abilities have been harnessed as a force of good. Stan Lee and Jack Kirby created the character in the early 1960’s with influences from literature and current events. 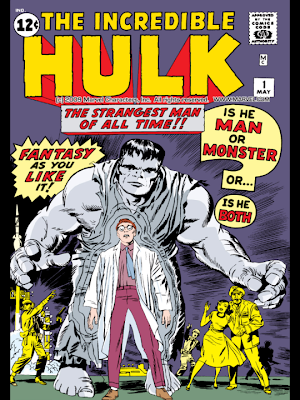 Mary Shelly’s Frankenstein (1818), and Robert Louis Stevenson’s Jekyll and Hyde (1886) are influences of The Hulk. In Frankenstein, a young scientist, Victor Frankenstein, creates a grotesque yet sentient creature in an unorthodox scientific experiment. His creation becomes “the monster.” The monster has moments of self reflection, wondering why he has been given such a terrible fate: to be created, and then hunted down and tortured by society. This theme is very much at play within the early Hulk comics. He doesn’t understand why this had to happen to him, and why people won’t let him run off into isolation and be at peace. This aspect of The Hulk’s personality is at odds with his often incited desire to destroy. This dichotomy leads to the other main literary influence. Jekyll and Hyde is a novella that explores the rare mental condition often called “split personality,” known in psychiatry as dissociative identity disorder. This refers to when more than one distinct personality exists within the same body. Jekyll and Hyde is especially relevant to The Hulk, as it portrays one distinctly good personality, while the other is evil. Dr. Henry Jekyll is at odds with his evil other personality, Edward Hyde. Jekyll asserts that “man is not truly one, but truly two,” and he imagines the human soul as the battleground for an “angel” and a “fiend,” each struggling for mastery. There are influences from The Cold War in the Hulk comics. After World War II, in 1947, tensions between the United States and the Soviet Union escalated and existed for much of the rest of the 20th century. Many international incidents occurred that brought these nations’ to the brink of disaster including the Berlin Crisis (1961) and the Cuban Missile Crisis (1962). The Hulk makes certain statements that point to his conception as an allegory for man’s ability to wage wars. In issue #1, Bruce Banner is afraid he’ll keep changing into “that brutal, bestial, mockery of a human — that creature which fears nothing — which despises reason and worships power!” In issue #102, the Hulk rages, “Me GO! Must kill…destroy! Must prove to world no one stronger!” These statements allude to the darkest natures of humanity during times of war. The upcoming Marvel movie Avengers: Age of Ultron explores similar themes about humanity’s warring nature, and ultimate hope for peace. The Hulk will be a part of that story, ever relevant as his very existence is a representation of the same struggle. Essentially, the question for every superhero is whether the ends justify the means. Both Batman and Superman refuse to kill their enemies, thus allowing them to cause even more havoc in the future. Batman pushes away those who care about him the most, Superman hides his true identity by lying to his friends and loved ones. Superheroes face a slew of ethical dilemmas, not the least of which is the fact that most of them are vigilantes—breaking the law even while saving the day. We often view comic book stories as simple cases of hero vs. villain, but such a perspective takes for granted the idea that superheroes are the good guys. In fact, moral virtue is a complicated concept, and what doing the right thing means depends on your perspective. There are nonetheless two main schools of thought on what makes an action right or wrong: deontology, which categorizes actions as good or bad in themselves, and consequentialism, which classifies each action based on its results. Essentially, the question for every superhero is whether the ends justify the means. There was quite a bit of controversy around the amount of destruction caused by Superman in the film Man of Steel. Many felt such destruction could have been avoided, and it was also left unclear how many people perished as a result of his battle with Zodd, whose death also left people questioning Superman’s moral foundation. This issue will probably inform the plot of the upcoming film Batman v Superman where Batman will question Superman’s regard for human life. Take Oliver Queen on Arrow, for example. He starts out as brutal vigilante who kills his enemies without hesitation. His mission is to avenge his father by taking out the criminals who had plunged Starling City into lawlessness. After the death of his best friend, Oliver decides to rededicate himself to saving the city, but he believes that in order to do so, he must become a hero called the Arrow and give up killing. On the show, this shift is presented as a positive decision, but is it really? He no longer murders people, but many of the criminals he puts away end up escaping and hurting more people. Is it more important for the Arrow to provide a positive example or for the villains to be stopped permanently? Oliver himself realizes the shortcomings of his no-kill rule: when faced with a choice between allowing a villain to harm one of his loved ones and killing the culprit, Oliver invariably chooses to compromise his principles in the name of protecting his family and friends. This inconsistency reflects the tricky questions superheroes face as well was the difficulty of putting ethical principles into practice. What do you think? Should superheroes strive to do the right thing or focus on protecting innocents no matter the cost? Or should they try to find a balance between the two? The world is always changing, and all of us with it, some of the latest and greatest scientific discovery has been in the field of genetics and evolution. Since Charles Darwin’s first postulations of evolution through his studies of the adaptations of finches and other animals of the Galapagos Islands to the scientific ‘miracles’ happening in labs today like growing human ears on mice, the field has been met with hesitation and hostility. The study of evolution is truly groundbreaking and revolutionary in our own understanding of life itself. Evolutionary insights have also inspired astonishing stories like X-Men. The X-Men are children of the atom developed in comics during the 1960s. First titled as “The Mutants” Stan Lee and Jack Kirby were advised to rename the comic, as at the time most people didn’t know what a mutant was. The stories of the X-Men showcase the more fantastical possibilities of mutations and delve into the social issues they would face as a new class of life. Inspired by Darwin’s legacy, the X-Men even have a character named after him, whose mutant ability helps him adapt to survive! But what is a mutant? Look no further than the immortal words of Lady Gaga, “Mutants are born that way.” Mutation is part of evolution, the process by which all the creatures in the world today became what they are. Mutations are fundamental changes to a person’s genetic code. The basis in the evolutionary truth of mutation sets X-Men apart as a long standing comic stories. The Avengers aren’t mutants, Tony Stark is a genius but impossibly so and not as a result of a genetic mutation as far as we know. 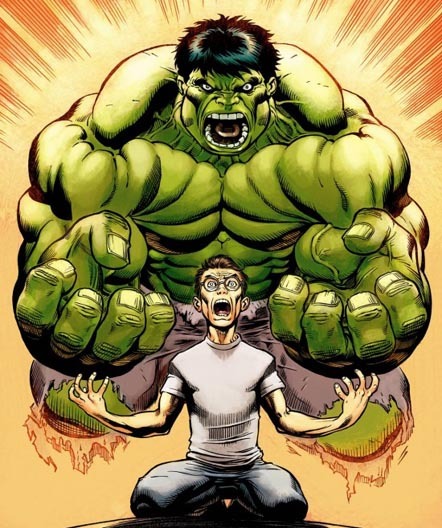 Captain America and the Hulk are not mutants, although their powers do come from the effects of serums and radiation they were born as average (or below average) people. Hawkeye and Black Widow are just regular people and Thor isn’t even human to begin with. Quicksilver on the other hand is an interesting case. He has appeared in both The Avengers and X-Men films. Just as he is in comics, in the X-Men films he is a mutant, he was born with the mutant gene which he inherited from his father Magneto. But in Avengers: Age of Ultron, his superspeed like his sister Scarlet Witch’s powers are the result of alien technology and radiation. Because 20th Century Fox owns the rights to the X-Men and the mutants, in the Marvel CInematic Universe they are known as “miracles” not mutants and Magneto doesn’t even exist. They are technically the same character with the same abilities just with completely different backstories and personalities, and only one of them is a mutant. In the X-Men films, all of the mutants are born that way, with their abilities manifesting at birth or near adulthood. The only other way mutations have been shown to occur is through the transference of other mutants, like Rogue, Viper, or Apocalypse. Though many believe her to be mutant, we probably will never know for sure, but either way Lady Gaga is right, mutants are born not made. In this lesson we will look at genetic mutations both fictional and real and try to answer the question – Are there mutants already among us? You may have noticed that there are a lot of reboots these days – remakes or updates of an older media property for a new audience. Lately, 80’s toy and cartoon properties like My Little Pony, Transformers, G.I. Joe, and most recently Jem, have all been updated decades later. Some are hip cartoons for kids and parents to watch together, like My Little Pony. Some are major blockbuster action movies like Transformers, G.I. Joe and TMNT. Some updates have a modern twist, like how the new movie Jem and the Holograms makes its protagonist an online viral media star. There are economical reasons for reboots. Testing new characters and ideas is a risky proposition for media producers who spend upwards of hundred of millions of dollars on popular media like Hollywood films, television programs, and video games. Established characters come with background knowledge from a tried and tested universe that producers can plug into and even change afterward, like when comic books that are adapted into movies or shows change based on its popularity. Comparing and contrasting original media properties to their rebooted versions tell us a lot about how different authors and producers tailor their media for different audiences. In this lesson, you will figure out how reboots are similar to or different from their originals and make some observations about what those differences tell us about the media property itself (including who owns it and how much it cost to make), different target audiences, and different techniques that rebooters use to tell the same story in a new way.